CANTON, Mass. (April 12, 2016) – Baskin-Robbins, the world’s largest chain of ice cream specialty shops, today announced that Island Creamery, Inc. (ICI) has acquired more than 20 Baskin-Robbins shops in Puerto Rico, becoming the brand’s new sole franchisee on the island. Under the agreement, Island Creamery, Inc. — owned and operated by Puerto Rico-based The Larrea Group, a company with nearly four decades of experience in the local restaurant industry — will transform and grow the brand on the island by remodeling existing shops and adding new locations in Puerto Rico over the coming years. 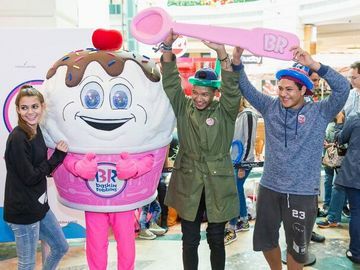 Baskin-Robbins currently has more than 7,600 shops in nearly 50 countries around the world, including more than 2,500 locations in the U.S. Baskin-Robbins has been a preferred ice cream brand on the island since 1976. The brand features an extensive array of premium ice cream flavors—including local flavors—along with custom ice cream cakes, delicious ice cream sundaes, refreshing frozen beverages and other frozen treats. Island Creamery, Inc.’s acquisition of the Baskin-Robbins shops represents a new era of possibilities for the iconic ice cream brand that has been present in the lives of Puerto Rican consumers for more than 40 years. This agreement has also sustained the jobs of more than 180 team members that diligently operate the more than 20 shops. In addition to developing new Baskin-Robbins restaurants in Puerto Rico, Island Creamery, Inc. will also remodel existing locations with the brand’s latest shop design, featuring bright and modern décor, comfortable seating, ice cream “super graphic” artwork, pink spoon door handles and digital menu displays to make it even easier for guests to choose and personalize their Baskin-Robbins order. 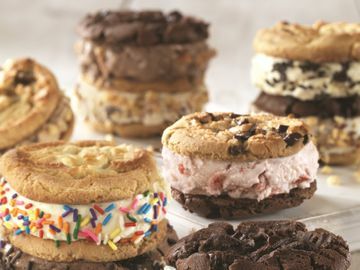 Baskin-Robbins provides a variety of premium ice cream flavors made with the highest-quality ingredients. Today, all locations in Puerto Rico offer once again the brand’s classic “31 flavors,” including such favorites as Pralines ‘n Cream, Mint Chocolate Chip and Cookies ‘n Cream. “We are honored and grateful for the opportunity to transform and grow the Baskin-Robbins brand in Puerto Rico, and are especially proud to have contributed to the preservation of 180 local jobs. It is a privilege to expand Baskin-Robbins’ presence in Puerto Rico and bring the brand’s world-famous range of ‘31 flavors’ and other delicious frozen treats to even more guests on the island,” said Juan Antonio (Tony) Larrea, President of Island Creamery, Inc.
Named the top ice cream and frozen dessert franchise in the United States by Entrepreneur magazine's 37th annual Franchise 500® ranking in 2016, Baskin-Robbins is the world's largest chain of ice cream specialty shops. Baskin-Robbins creates and markets innovative, premium hard scoop ice cream and soft serve, custom ice cream cakes and a full range of beverages, providing quality and value to consumers at more than 7,600 retail shops in nearly 50 countries. Baskin-Robbins was founded in 1945 by two ice cream enthusiasts whose passion led to the creation of more than 1,300 ice cream flavors and a wide variety of delicious treats. 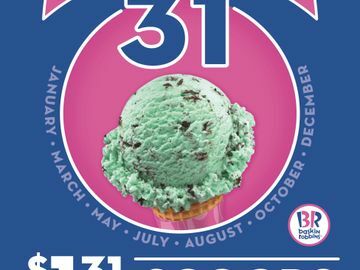 For further information, visitwww.BaskinRobbins.com. Island Creamery, Inc., part of The Larrea Group, will now operate all Baskin-Robbins shops in Puerto Rico. Founded in 1976, The Larrea Group owns and operates multiple U.S. franchise restaurant concepts in Puerto Rico with a team of 7,000 people.